Welcome to a new segment here at Comfort Bites, called (as you may have guessed from the title) Hot Dog of the Month. Experts have predicted that hot dogs are set to be a big trend for 2013 and they reckon we'll be tucking into all sorts of gourmet versions of the snack. I'll be experimenting and coming up with some different twists on the classic hot dog and will feature a new hot dog each month from now on (maybe even more than one per month, if I find a really good one). 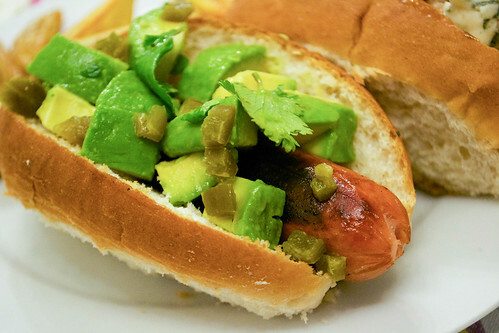 The first is this: a hot dog with a zesty, creamy topping of avocado, lime juice and coriander which works so well against the salty, smoky frankfurter and soft, white bun. I sprinkled over some jalapeño chillies to give it a bit of spice too - if you try this, let me know what you think. Roughly chop half a ripe avocado and place in a bowl, squeezing over the juice of half a lime. Cook your frankfurter in a little oil in a pan until browned, and once it's hot, slide it into a hot dog roll. Roughly chop some fresh coriander leaves and stir them into the avocado. Pile up the avocado chunks onto the hot dog and scatter over some chopped slices of jalapeño chilli. Hot Dogs: how do you eat yours? Yum, frankly. This looks delicious!